Fire staffs come in many shapes and sizes. They are generally made from aluminum piping with a wooden core in each end to prevent heat transfer. Kelvar wicking is used on each end and staffs are wrapped with super absorbent grip tape. 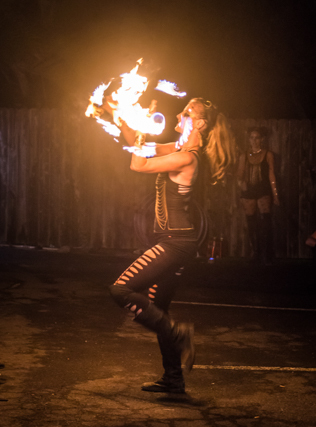 Single or double fire staff performance is a technique all in itself, in which the dancer can move in contact with the prop, manipulate the staffs in isolation, toss or spin in a variety of patterns for light mandalas. Dragon staff is a 10 wicked staff used to roll on and around the body much like contact staff. Unlike fire poi, the staffs are held in the hand, so learning how to spin with a loose grip, allows for more rotations to be made with each spin. Single or double fire staff is used more linearly than other props due to the lines/planes, which must be sustained, in order to execute correctly. 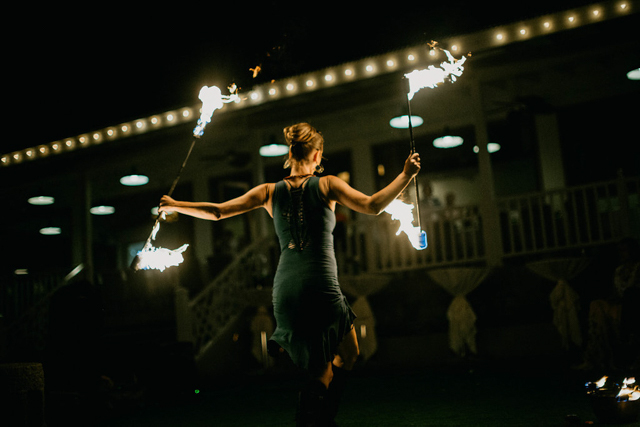 Fire Staffs are multi-dimensional props and are beautiful when seen in action. Some people mix up the Samoan Fire dancers (also known as Samoan fire knife) with single or double staff spinning. Unlike Samoan Fire knife, staves do not have a blade on one side. However, similar moves are excecuted when spinning one or the other. Hawaiian fire dancers range from a myriad of styles. Single/ double / Dragon fire staff spinning has a completely unique set of moves in which the dancer performs in a variety of ways. Dancing with fire staffs is a unique and beautiful performance. Both men and women can proficiently utilize this tool with grace. Although it has a warrior like nature and feel, staff dancing can be smooth and elegant .